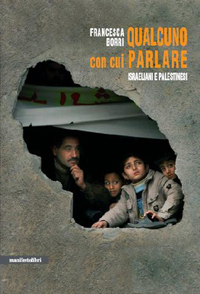 This interview is taken from Francesca Borri’s book “Qualcuno Con Cui Parlare: Israeliani e Palestinesi” (Someone to Talk To) (Manifestolibri, 2010) a collection of eighteen interviews with Israelis and Palestinians. Men and women, who despite their experiences of war and conflict still assert their identity as human beings, refusing the straightjacket of being classified simply as Israeli or Palestinian. Sitting in a Beirut café in the morning sun, a cappuccino and a croissant will set you back ten dollars. Five minutes away – down to the bottom of the road and turning right at the mosque – that is the sum that a Palestinian receives every three months from the United Nations. Palestinians make up eleven percent of the population of Lebanon: 450,000 refugees spread across twelve refugee camps (on average forty sqm for every ten people), half of them without water, electricity or sewers. Sixty percent live below the poverty line, and twenty percent live under the life sentence of a chronic illness. We are now at the third and even fourth generation of refugees, and for many the “memory” of Palestine is no more than an old photograph. Nevertheless, when you ask how they imagine Palestine, the response is always the same, just one word breathed in almost a whisper: “Wonderful”. Kassem Aina was born in Alma in 1946. “It still exists,” he tells me: “I can go down to the south of Lebanon and look at it from across the border.” But the photograph that he lightly dusts off for me in reality is just like the others. “Sometimes different cities follow one another on the same site and under the same name, born and dying without ever knowing one another, without communicating among themselves” wrote Italo Calvino. Because every “invisible” Palestinian city here is no different from Calvino’s city of Maurilia: “whose old postcards do not depict Maurilia as it was, but a different city which by chance was called Maurilia, like this one.” (Italo Calvino, Invisible Cities, 1972). Because it’s true, Alma does still exist. And it still has the same name. But it’s a kibbutz. Beit Aftal Assomoud is the first association founded by Palestinian refugees in Lebanon. It was set up in 1982 for a kind of collective adoption of the orphans of Sabra and Chatila. Today the association is active in all the camps, and it is often the only access to health and social assistence available. Kassem Aina, Beit Aftal Assomoud’s founder and director, talks to Francesca Borri. The Lebanese government’s argument is straightforward and quite groundless. If the Palestinians were to have housing and jobs here, they say, we would lose all interest in returning to Palestine and in maintaining our opposition to Israel. So, using the excuse of Arab solidarity, Lebanon adopted a policy of denying us our fundamental rights. But all the diaspora Palestinians, wherever they are, including those who have managed to achieve a normal life, dream of returning. The two issues are not connected at all. The goal is not to forget the Nakbah (catastrophe of 1948); but the actual effect is that in the meantime, it is just being perpetuated. It’s not just the violation, but the direct elimination of the basic human rights granted by the Universal Declaration. Starting with Article 23: work. The right to work is a fundamental prerequisite to all the other rights, because only work can provide autonomy and dignity. Here the general principle for foreigners is reciprocity: once you’ve got a work permit, your status is the same as that which your own country accords to the Lebanese. But reciprocity is a non-sense for us: we haven’t got a state. Palestinians are banned from taking up seventy-one professions: including that of jeweller, mechanic and shop assistant – and obviously, the entire public administration. For others, such as lawyers, doctors and engineers, you need to be admitted into professional orders: and professional orders, once again, are governed by the reciprocity principle. For the remaining jobs (ie. essentially unskilled menial labourers), we need a work permit like all the other foreigners – even though we are not immigrants. Only 0.3 of work applications succeed, 223 out of 70 thousand last year. To give you an idea, for the Egyptians the percentage is 87%. So all that is left to us is illegal/off the books work, or work in the camps, running micro-businesses or artisan trades that UNRWA (the United Nations Relief and Works Agency set up for us in 1948) has trained us for, like shoe repairs, sewing and carpentry. The camps have become our acquarium. The Universal Declaration also talks about the right to own property (Article 17), but reciprocity is in force here too. And what we now own cannot be passed on to our heirs. The result is over-crowding and the further deterioration of an already dramatic situation. Then there is Article 26, which should guarantee the right to education. 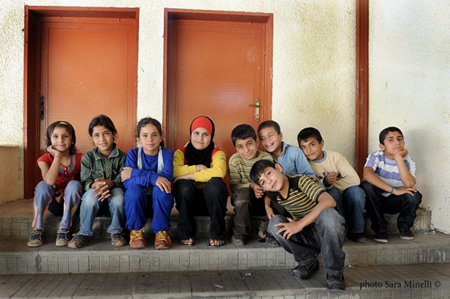 UNRWA provides primary education. But then the high schools and universities in Lebanon only admit limited numbers of foreigners, and the fees are three times higher. Anyway, why would you want to get a degree in medicine if you are not allowed to become a doctor? One third of Palestinians don’t even finish primary school. Respect for human rights cannot be subject to political considerations. Poverty generates tensions: it adds nothing to our determination to return. In reality in many camps the population is no longer solely Palestinian. Anyone can move in here. More and more often it has become the chosen destination for the unemployed, or immigrants or desperate people fleeing other wars, like the Iraqis – underground humanity – the wretched of the earth. However for the Lebanese it is a non-existent world. And here the Palestinian situation becomes a metaphor for our times. This is not simply the perifery of Beirut, but one of globalization’s innumerable dumping grounds. Statistics about us are never more than estimates: because vagueness provides a margin of manoevre that can be exploited by the government to create uncertainty and fear. No-one knows exactly how many of us there are, or where we are or what we are doing, nor what our intentions may be. We are a shadow waiting to ambush you just around the corner of your lives. It is not simply a question of Arabs and Israelis. Palestinians are the the migrants who inhabit the sea-bed of your Mediterranean. The Lebanese accuse you of being a destabilizing force. The cause of the civil war. The civil war was a conflict between extremist Christians and progressive nationalists, who were joined by the Palestinians. But the divisions already existed: between Christians and Muslims. Lebanon has a very particular governmental structure which is divided along denominational lines: ie. on a rigid division between the various religious communities – eighteen of them – and the distribution of all jobs in the public sphere (of all levels) among these communities, according to a fixed quota system. But the quotas are still calculated on the basis of the 1926 census, even though the demographic situation has changed and there are now far more Muslims than Christians. Not only that, among Muslims there is the diifference between the Sunni and the Shia – the Sunni are linked to Saudia Arabia, the Shia to Iran, the two rival interpretations of contemporary Islam. In the face of such complexity it makes no sense to attribute clear-cut blame. Do you remember Primo Levi? He said: “Everyone is somebody’s Jew” – we are the Jews of Lebanon. The only thing all Lebanese agree on is our right of return, because otherwise we would create a serious imbalance in their confessional system. In Syria the Palestinians have the same rights as Syrians, apart from the fact that they are not allowed to vote. And in Jordan they have equal rights to Jordanians. The instability of this country hinges on its confessional system, on a fragmentation that requires the “cement” of an enemy – and on colonialism naturally, past and present. Nevertheless you are an unsustainable economic burden for such a small country. Lebanon hosts hundreds of thousands of foreign workers. Our situation is very different. To start with, we arrived from a country that was economically and culturally more advanced. At the time, in the 1950s, Lebanon was still essentially rural: while the Palestinian middle class was among the most dynamic in the Middle East. Our businessmen invested their money and their expertise here. And in fact many were quickly rewarded wiith citizenship – things are always simpler if you are rich – and possibly Christian rather than Muslim. But today, the Palestinian presence doesn’t have a negative impact at all on Lebanon. Other foreigners, like the Philippinos who work as servants for Beirut families, send everything they earn back home: for us it’s the opposite. We live on remittances sent from abroad: and we produce and consume here. Above all, there are the millions of dollars spent by the dozens of international organizations which are here for us, and who buy everything they need on the Lebanese market. All this in exchange for nothing, because we don’t even have a minimal level of social assistence. Even those few who have a real job pay taxes like everyone else, including national insurance contributions, but welfare services for foreigners are subordinate to reciprocity. So no pension, no insurance. No holiday or sick pay. And this is not socialist rhetoric. It is Article 25 of the Universal Declaration of Human Rights. But with no right to vote, and no political representation, how do you make your claims heard? We start with ourselves, here in the camps. We don’t even have the right to freedom of assembly or association, but in the end this is the only life we have, day after day. We started with the orphans thirty years ago, in order that the pain and grief could be converted into understanding, kindness and the care for and consideration of others – not into hatred and rancour. Because we are here now, and the only thing to do is try to make this hell a little more bearable. All this makes it clear that the problem is political, not humanitarian. From the very beginning Palestinians were offered alternative living arrangements in order that time would fade the desire to return. It was a calculated choice. The land for the refugee camps was rented for one hundred years – but justice is not for sale. And so, like UNIFIL did with the war, UNRWA has only contributed to congealing the situation, transforming us from refugees into hostages: no intergration nor return – only survival. Politics is elsewhere. But we want rights, not charity. In a conflict, separating the political from the humanitarian aspect is simply abdicating responsibility – giving in to the will of the strongest. Only Palestinians are outside the jurisdiction of the UN High Commission for Refugees. In the rest of the world, refugees are entitled to far more protection, and above all, unlike wiith UNRWA, this protection speaks the language of human rights, not assistence. Starting with the freedom to work. There are innumerable International NGOs in Lebanon. Yes, and there are innumerable handouts, innumerable sacks of rice, all in the name of some illusory neutrality. It is no coincidence that many of these NGOs arrive in the wake of the so-called “peace missions”: a kind of sub-contract to guarantee we can be bombed alive. And not all of the associations are transparent, unfortunately. When it comes down to it, the hands in the mire are ours: but when funding finally does get to us the amount has already been reduced by a variety of “costs” – incurred by the aid workers, rather than the Palestinians. But above all, so many of the NGOs stubbornly insist on running projects that we have no need of. There are honorable exceptions like the Italian NGO Un Ponte Per…, but usually they arrive here with ready-made projects: requiring no more than indigenous manpower. A refined form of colonialism. And we are forced to adapt our reality to their theories. These days for example, you don’t get a single dollar unless you include gender perspectives in your activities. Violence against women, discrimination against women. Micro-credit and the empowerment of women. But a community has a fragile alchemy. It’s not about teaching women to embroider tablecloths. And before you label me as a typical, reactionary Muslim : I’m an Arab and an atheist. But you can learn to embroider tablecloths from your grandma. Free of charge. Beit Aftal Assomoud is the main partner of Italian humanitarian NGO Un Ponte Per… for its aid projects aimed at Palestinian refugees in Lebanon, including the Family Happiness child sponsorship programme. The Family Happiness project offers economic support for Palestinian children who belong to family groups facing economic difficulties in the Lebanese refugee camps. In cooperation with the partner association Beit Atfal Assumoud, since 1996 economic support has been regularly provided to 103 Palestinian children and their families thanks to private donors. Since the Oslo Accords, the refugee question seems to have become less and less of a priority for the Palestinian Authority. The issue over which to compromise the most, in the name of peace with Israel. It’s time to debunk certain myths: we have never been financially supported by the Palestinian Authority, nor were we before by the PLO. It is often said that after the Gulf War and Arafat’s ill-advised solidarity with Saddam Hussein, the Arab countries diverted their financial support to Hamas and away from Arafat, forcing him to cut the funds destined for the diaspora. But that’s not how it was. Arafat had many merits, but he made one fundamental mistake – blurring the boundaries between Fatah, the PLO and the Palestinian Authority. Palestinian Authority resources always ended up with Fatah. Even now only those with connections to Fatah or Hamas get any money. People like us caught in the middle – by far the majority – are simply forgotten. But it really is time to put an end to the Fatah-Hamas split and dedicate our time to more serious things. The success of Hamas is due to the inefficiency of Fatah: but for us the only important issue is national unity, because frankly – I want to debunk another myth – I don’t think the Hamas top brass are starving. It is not true that the shops are empty. Everything is smuggled in from Egypt. It’s just that war is never the same for everyone. So all you have left is Hezbollah? Let’s say they are the only ones who have never killed a Palestinian. They do try to defend us, but only, mind you, on the issue of our right of return, not in terms of our social situation here in Lebanon. Parliament decided unanimously, Hezbollah included, to deprive of us the right to property. But in the final analysis, either the refugees have to renounce their right of return, or Israel has to renounce its Jewish nature. Many people say that there are too many of us for such a small country. Yet Israel continues to welcome new immigrants from all corners of the world, and to guarantee the right of return to anyone who can come up with an old Jewish aunt. So really it’s not a question of sustainability but rather of political will. Before 1948, or rather, before the Zionist distortion of Judaism, we all lived together without any trouble. I don’t understand why we don’t concentrate our imaginative and innovative skills on this – on finding a way of living together again, instead of focusing on divisions and walls, percentages and surreal projects for bypass roads, bridges, tunnels, parachute operations, towns at the bottom or the top of the hill. The future does not lie in religion-based states – either Islamic or Jewish. It’s not a question of giving up anything here, but rather the idea of complementing each other and mutually enriching our lives. For their own sakes, not for ours, the Israelis need to recognize their responsibilities. They don’t realize that 1948 was their nakbah as well: condemning them to a permanent state of exceptionalism, of war and fear – prisoners behind eight metres of cement. If the Israelis really want to think of it in terms of renouncing something – given that there is already a large Arab minority living in Israel – they would not be renouncing their Jewish nature, but the democratic nature of Israel. Francesca Borri is also the author of “Non Aprire Mai” (Meridiana, 2008) on the conflict in Kosovo. A freelance journalist living between Damascus and Beirut, her articles on the Middle East in Italian appear online on PeaceReporter – translated into English, French and Spanish.